Most telescopes come with one or two eyepieces which give you one or two magnification options. However, if you want to optimize your viewing experience you’ll need to invest in a better-quality eyepiece. By having a range of magnifications you can optimize the image, which means you need more eyepieces. I want to help you select the best eyepieces for your budget and your telescope. So, I am going to organize the guide around five questions and four formulas. As we go along I will refer back to these so don’t worry if you can’t answer the questions or understand the formulas now. Once we are done they will make sense. What is my budget per eyepiece? What diameter eyepieces will my telescope accept? What focal length eyepieces should I buy? What apparent field of view and eye relief do I want? How will my telescope’s focal ratio affect my purchases? Don’t worry about the math as it’s simple stuff you can do with any calculator, on paper, or perhaps in your head. These are things you will want to know and use. If you just want eyepiece recommendations and don’t care about the details, I’m adding that section right below before we go into the specifications that answer the above questions and make use of the formulas. But I think you will feel more confident about your purchases and be less likely to be disappointed if you read through the guide. What follows are specific eyepieces that I have tried, own or have read so many good reports that I feel very comfortable recommending them. These are the workhorse eyepieces of today. They deliver sharp images in almost all telescopes. The 50 to 52 degree AFOV is wide enough for general observing. I have used and recommend Meade, Celestron, Orion, and GSO. If you are on a tight budget, you can’t go wrong with Plossls. Just remember that at focal lengths of less than 12 mm the eye relief can get short. And if you are wearing glasses, consider staying with the longer focal lengths and using a Barlow to achieve higher magnifications. These, and the essentially identical AT Paradigm are universally praised as good quality eyepieces with a wider 60 degree apparent field of view. They also offer more eye relief than Plossls at the shorter focal lengths. If you want a good eyepiece with a bit wider field of view but are on a budget, these are a very good choice. This was my first zoom eyepiece and the one that caused me to fall in love with the zoom. The zoom lets you explore your target over a wide range of magnifications without having to change eyepieces. If you are on a strict budget, this is a good choice as a zoom eyepiece. The Meade 8-24 zoom is the same eyepiece with a different label. These come in 2” and 1.25”. I have the 2” 20 mm as one of my low power wide view eyepieces and it is excellent in my F5.9 scope. At $149 for a wide view 2” it is a steal. I also have the 5.5 mm which is my highest power eyepiece. The full line is good. The 82 degree AFOV provides a wide field of view with a sharp and well-corrected image even in F6 telescopes. These eyepieces have an adjustable twist-up eye guard that adjusts to your personal liking. However, this eye guard adds size and weight which is the only negative I can offer for these. Great views at a midrange price. 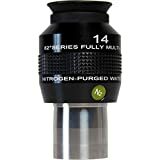 Offered in both 2” and 1.25” these are excellent eyepieces. I often recommend the 2” in this series as excellent low power wide view eyepieces, especially in scopes at focal ratios below F7. For the cost, it’s very well worth to spend the money for this eyepiece. The ES 82s are my favorite eyepieces, especially in the 1.25” format. Wide view and well-corrected view, even in F5 scopes. These are often compared to the higher priced offerings. They have a smaller eyepiece cup than the Meade 5000 which makes them smaller and lighter. This is my all-time favorite eyepiece and the one I use more than all the others put together. While it is the same range as the Celestron zoom, it offers better optics, better mechanical operation and a wider field of view. It costs four times as much as the Celestron zoom but if you have the budget, this is the one to get. These are just a few examples of eyepieces that I have used, and some that I own. I can recommend these with confidence. There are so many others at comparable or higher prices, many of which are quite good and some rather poor. To get the best performance you have to be willing to pay the price. But the difference in price to get to the next level is high and the performance difference may be small. But some people demand the very best, and it is out there, at a price. Since there are so many different types of eyepieces available on the market, choosing the right one for your situation can prove to be a harrowing task. In order to help you narrow down your choices, we’ve created a short guide that can help you to figure out what the best viable option is. Whether it is cars or telescope eyepieces, there are inexpensive ones, the upgraded models and the very expensive ones. They all work but as you go up in price you gain features or performance or both. Do you need to have the best to enjoy astronomy? That is up to you and your budget. I don’t think so. Over time you will likely spend more on eyepieces than you spent on the telescope. But don’t fear you will waste your investment as eyepieces are standard sizes. If you upgrade the telescope or add a second one, the eyepieces will work in that telescope too. Eyepieces under $100 each are generally considered budget or low-cost eyepieces. There are some very good choices in this range. Think of these as your Ford, Chevy, and Toyota of eyepieces. They work great every day and get you where you want to go, but don’t have what the higher priced models have. Between $100 and $250, I will call mid-range. This is your Lexus, Acura, and Infinity types that offer more features, better build and a bit more polish. Many approach the quality of the premium brands. Here we have very good eyepieces with some extra features. Over $250 I will label premium eyepieces. Here we get into the BMW, Cadillac, Porsche, and Ferrari of eyepieces. Price can run to over $1000 per eyepiece. These are the best in optical performance and build quality. It costs a lot to get that last 10% of performance. If you are very demanding and must have the very best, this is where you want to be. What Diameter Eyepiece Should I Buy? 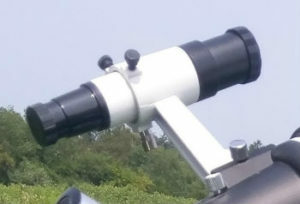 Most modern telescopes use a focuser or diagonal that accepts 1.25” eyepieces. Some accept 2” and have an adapter that allows you to also use 1.25”. These sizes have become the industry standard sizes. Take a look in your manual or user’s guide. It should list what size eyepieces you can use. Or take one of your eyepieces and measure across the bottom of the barrel. Why two sizes? A 2” barrel on the eyepiece will allow the manufacturer to create an eyepiece that provides a wider field of view. But just because an eyepiece is 2” doesn’t mean it has a wider field of view than one that is 1.25”. We will talk more about the field of view later, but note that if you can use 2” eyepieces, you will typically only have one or two for very low power wide field views. All the rest will likely be 1.25”. It doesn’t matter what type of telescope you have as long as your scope takes these standard sizes. Your eyepieces do not need to be the same brand as your telescope. You have a very wide choice of brands and styles to choose from. There is no problem using a Celestron eyepiece in a Meade telescope, for example. If your scope uses eyepieces that are closer to 1”, then you have an old style .965” that is now obsolete. You can still get eyepieces but there are few choices. There are inexpensive adapters that will let you use standard 1.25” eyepieces in a .965” focuser/diagonal. However, there can be a problem bringing the eyepiece to focus. I haven’t addressed .965” eyepieces in the recommendations. Most telescopes come with one or two eyepieces. Typically these will be 25 mm and 10 mm or something close to that. This will give you a lower power and a medium to high power eyepiece, depending on the focal length of your scope. But these are only intended to get you started. 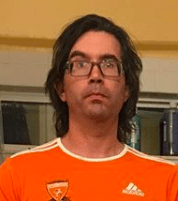 Why do you need more than two eyepieces? Because some objects look better at low power, some at medium power, some at high power and some at very high power. It is as simple as that. Not everything in the sky benefits from high magnification. Also, atmospheric conditions can limit how much magnification you can use on a given night. If you look up transparency and “seeing” in the context of telescopes you can learn more about how atmospheric conditions will affect what magnifications you will choose on any given night. The bottom line is that it is best to have several magnification choices so you can optimize the view. To determine a magnification range we will start with the aperture of the telescope, the size of the front lens or the mirror in the back. This determines how much light the telescope will gather. The more light that is gathered the more magnification that can be applied to the image, up to limits that are imposed by the atmosphere. To estimate the highest practical magnification for your telescope you take the aperture in millimeters, mm, and multiply by two. 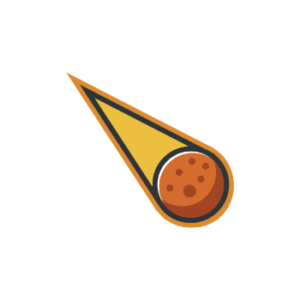 This will give you a maximum target for planning purposes. Nothing will stop you from trying to go higher but in all likelihood, the image will be poor and not worth the cost of eyepieces to achieve it. 70 mm scope will have a max of 140X for planning purposes. 130 mm scope will have a max of 260X for planning purposes. There is no guarantee that you will be able to get a good image on any given target at that level of magnification on any given night. This is just a planning target. The atmosphere is typically the limiting factor as we get to higher magnifications. Even big telescopes are subject to limitations imposed by the atmosphere. Now we have a maximum established. Let’s look at the minimum. In this case, I am going to define this by focuser and eyepiece size. 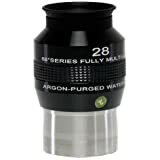 If your focuser/diagonal only accepts 1.25” eyepieces I will recommend you use a 32 mm as your longest focal length, lowest power eyepiece. I usually recommend a 32 mm Plossl type eyepieces as that provides about the widest view you can achieve in a 1.25” focuser. Plossl eyepieces are very good and fairly inexpensive, typically between $25 and $50 each. If your focuser/diagonal will accept 2” eyepieces then I will suggest you get one or two 2” eyepieces for your low power wide view eyepieces. Consider something between 35 and 40 mm in focal length with an AFOV of 65 degrees or wider for your lowest power eyepiece for your telescope. We will talk about the AFOV of an eyepiece in the next section. Now we can establish a target magnification range. Let’s do an example. We will use a 100 mm telescope with a 600 mm focal length that only takes 1.25” eyepieces. To achieve the maximum of 200X (2X the aperture of 100 mm) we solve for the focal length. 600 mm / 200X = 3 mm This will be the focal length of our highest power eyepiece. We have a range of 32 mm to 3 mm. Now we just divide it up and fill in some sample focal lengths. You could base this on 3, 4, 5, 6 or more focal lengths/magnifications. I am going to use 6. Some people have more than 6 and some as few as 3. Note that as we get into the higher magnifications the millimeter jumps between eyepieces focal lengths gets smaller. If your telescope’s focal length is different, just change the focal length in the formula. If you have a longer focal length telescope, your shortest focal length eyepiece will be a higher number than what I have shown here. Just start with 32 mm for your low power eyepiece. Then set your maximum based on your aperture and split it up. Focus on the magnifications rather than the mm of the eyepieces. Zoom eyepieces make things simpler. A zoom eyepiece works like the zoom lens on a camera. They provide a range of magnifications with one eyepiece. A typical zoom eyepiece has a focal length range of 8 mm to 24 mm. If we look at the range I provided above, we see that we could replace several eyepieces with one zoom. And the zoom provides every magnification in that range without having to change eyepieces. My most used eyepiece is an 8-24 mm zoom. A Barlow lens can save you money and add flexibility. A Barlow lens is an optical device that goes between the eyepiece and the focuser. It was named for Peter Barlow who invented in the 1800s, so it is usually capitalized. It allows each eyepiece to provide two magnifications. For visual use, 1.5X, 2X, 2.5X and 3X Barlow lenses are common. Higher than 3X are usually reserved for astrophotography. For example, if you put a 30 mm eyepiece in a 3X Barlow it will triple the magnification you get from that eyepiece. Another way to look at it is that a 30 mm eyepiece in a 3X Barlow works like a 10 mm eyepiece. To achieve six magnifications you can have six eyepieces. 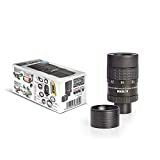 Or, you can have three properly sized eyepieces and use a Barlow lens to achieve three more magnifications, which is usually a less expensive way to go. I often recommend the use of a Barlow to achieve the higher range of magnifications. In the beginning, you are not going to know what the atmospheric conditions might be in your area. In our example, we targeted 200X as the top magnification. But you may only be able to achieve that rarely. So perhaps you do your line up like this. Using this approach you would buy a 2X Barlow and hold off on the 4 mm and 3 mm to see if you can reach these magnifications often enough to justify buying an eyepiece. Or, you may find that you like the 8 mm and 6 mm used with the Barlow and can avoid the expense of two eyepieces. Note that we also gained a 16 mm magnification at no additional cost. This gives us more flexibility at the low end of the magnification range. If we combine a Barlow with an 8-24 mm zoom eyepiece we have an amazing range. Using the zoom approach with a Barlow your eyepiece set would consisit of a 32 mm low power eyepiece. You use the 8-24 zoom for the midrange. Put the zoom in the Barlow for the high range. If you go this route you can always add single focal length eyepieces along the way to serve specialized purposes. But with 2 eyepieces and a Barlow, you have the full effective range of your telescope. How you divide up your magnification range is up to you. But, if you have a plan you can fill into those slots, working toward a well-balanced set of magnifications. This saves money and helps you buy in an organized manner. What Field of View and Eye Relief do I Want? We will now discuss the specifications of eye relief and apparent field of view. These are two very important considerations when you are looking for eyepieces. Eye Relief – This refers to how close your eye has to be to the lens in order to see the full field of view. Most people will be fairly comfortable with eye relief of 12 mm or higher. However, some eyepieces have eye relief as short as 5 mm. They are useable, but your eye will be extremely close to the top lens glass. If you are a glasses wearer and plan to keep your glasses on while you are observing, then you will likely want eyepieces with at least 17 mm of eye relief, and some glasses wearers prefer at least 20 mm. With your glasses on you simply can’t get your eye close enough to an eyepiece that only has 10 mm of eye relief. Apparent Field of View – This is a measure of how wide a view the eyepiece will provide as compared to alternate eyepieces. This number can range from 30 degrees to 120 degrees. This is where the second formula comes into play. Let’s illustrate with an example using a 1200 mm FL telescope. We will use 10 mm as the eyepiece focal length but we will look at three different 10 mm eyepieces, each with a different apparent field of view, AFOV. Note that the full moon appears as approximately .5 degrees across, so use that as a mental reference when looking at the numbers. Imagine you are looking at the moon with each of these eyepieces and consider what you would see. In general terms, the higher the AFOV number the more the eyepiece will cost. And, in general terms, the higher the AFOV the harder it is to make an eyepiece that will present a good image all across the field of view, which also drives up the cost. When discussing eyepieces you will hear people comment on how well the eyepiece is “corrected”. They are referring to how much or how little distortion is visible as you look from the center of the image out toward the edge. We can see that 2” eyepieces have an advantage over 1.25” eyepieces when designers are making wide view eyepieces. The larger barrel allows them to create an eyepiece with a higher AFOV. That is why I suggest, if you can use 2” eyepieces, you will want one or two low power wide view 2” eyepieces. If you can’t use 2”, that 32 mm Plossl, which has a 50 degree AFOV, will give you about as wide a field of view as you can get in a 1.25” eyepiece. When you add eyepieces to your collection you will want to consider what field of view you want and how much you are willing to pay for it. Note that many cheap eyepieces promise a wide AFOV but deliver a view with a lot of distortion or aberration as you move away from the center of the field of view. Here are a few types of eyepieces you may read about and their typical AFOV. I add comments on where you may find and use them. There are many more designs that are associated with specific brands, but the ones above are designs that are produced by many companies in one form or another. And new proprietary designs come out from time to time. I consider the Plossl to be the minimum standard for a good eyepiece. You can build a full set of these with good results, but be aware of eye relief, especially if you wear glasses. After these, we have mostly proprietary designs from various eyepiece companies. In most cases, these are eyepieces that are focused on wider AFOV or better correction for low focal ratio scopes. These tend to run toward the more expensive price range. In simple terms, high focal ratio scopes, say those over F6, tend to be less demanding on eyepieces than those below F6. Depending on how fussy you are about having a completely clean image across the visual field, if you have a lower focal ratio scope you will want to look for eyepieces with a reputation for being “better corrected” in low focal ratio scopes. Low focal ratio scopes deliver the light rays to the eyepiece at an ever-increasing angle as the focal ratio number goes down. As a result, this can cause aberrations in the image as you move from the center of the view toward the edges. I won’t go into all the types of aberrations there can be, let’s just say that once you get below F5 it is really hard for the eyepiece to deliver a clean image to the edge. Also, as the apparent field of view gets wider the image will require more correction. Again this is more noticeable in lower focal ratio scopes. So, if your scope is F6 or lower, you may want to consider some of the higher priced, better corrected eyepieces if you want the best image to the edge of the field. If you are looking at eyepieces that are wider than 55 degrees AFOV you will again need to consider looking at the better corrected, and typically more expensive eyepieces. It all comes down to cost benefit. You have to decide how fussy you are about the edges and what your budget can tolerate. Does the type of target matter? Perhaps you have read about planetary eyepieces and DSO eyepieces and other types of specific eyepieces. 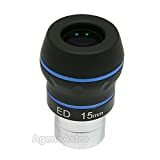 Do you need a 10 mm planetary and a 10 mm DSO eyepiece? In my opinion, you do not. Unless you are a professional astronomer or extremely demanding, you can select your eyepieces based on magnification, the apparent field of view, eye relief and price. You can use the same eyepiece on planets and deep sky objects, DSOs. Over time you may wish to add a specialty eyepiece here or there but I would not make that a priority until you have filled out your magnification range. If the above guide has helped you understand the terms and working of eyepieces, scroll up and make a selection from our recommendation list. The magnification range that is appropriate to your scope. Know what diameter eyepieces your scope takes. Pay attention to the eye relief, especially if you will be observing with glasses. Look at the apparent field of view specs and understand what this means to the field of view. Be aware of the focal ratio of your scope. Eyepieces are standardized so whatever investment you make today, the eyepieces will continue to serve you in any future scopes you may own. I have four telescopes but I use the same eyepieces in all of them.